Things to Make With Them. Where To Buy Them. Ideas, Craft Projects, and Inspiration For Valentines, Handmade Greeting Cards, Envelopes, Tags, Decorating Ideas, Wedding Crafts and More! Bobunny Press sells packages of 20 small paper doilies. In the small packages, each doily measures about 4 inches — perfect for paper crafting. This doily pack is from the BoBunny Essentials collection. You can get more info, or purchase these at Scrapbook.com. The Freund Mayer paper lace placemats shown above could be creatively altered and re-purposed in a variety of ways. 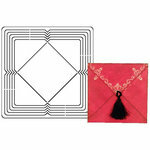 Or, you could use them as intended; they’ll add a lacy touch to a tray or table place setting. Click the photo above for more information. I have been compiling a list of things to do with paper lace doilies. Here are some of the things I came up with. If you have done other creative things with them, please feel free to comment and share! Make a winter holiday greeting card using a paper lace doily with a slice cut out of it; the doily resembles a snow bank, and you can create a snowman scene using other embellishments. Click here for instructions. 1) Use paper lace doilies as the basis to create your own Valentines Day cards and other greeting cards! 2) Use paper lace doilies to add a romantic touch to the table settings and decor at your wedding reception. 3) Use them to decorate for Valentine parties or other holiday parties. 4) Attach paper lace doilies (or cut-out and / or punched-out pieces of paper lace doilies) to imperfect or damaged vintage Valentines to cover the flaws. 5) Make your paper lace doilies into gift tags by cutting them out using a scrapbooking punch in the shape of a tag. I have a “Whale of a Punch” tag punch by EK Success that I use for doing this, but you could use just about any tag punch. For that matter, you don’t have to use a tag punch. 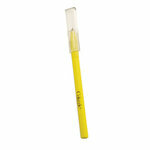 You could use an oval punch, a circle punch…any punch that doesn’t have a lot of detail. I’ve found that sturdier doilies work best for punching, though. Really fragile vintage doilies tend to tear or fall apart when you punch them. If you do accidentally tear one, just stick a sticker on top of the torn area. If you have vintage doilies that are imperfect (tears, stains, holes, etc.) then this is a great way to use them. 6) Transform your paper lace doilies into super-fancy, lacy, romantic envelopes using an envelope template. This idea is perfect for creating your envelopes to mail your wedding invitations in; you can also use this idea for lots of other greeting cards or letters, including valentines. Envelope templates are available in a variety of sizes. The larger envelope templates might be too large for use with smaller paper lace doilies, but they could be used with the larger placemat – sized doilies. An envelope template by Deja Views is pictured above. These envelope templates are available in several sizes, and are really versatile. You can use them for lots of things other than just making paper lace envelopes, of course. You can use them with plain cardstock, patterned paper or pretty much any paper that is sturdy enough to be folded into an envelope. Each template features a parallel lettering guide, plus a pattern for a card as well its matching envelope. 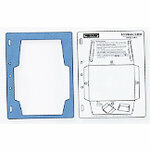 The templates are made of C-Thru blue plastic, which is imprinted with instructions for both the envelope and card. 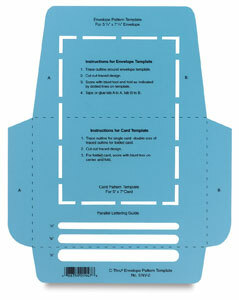 The Coluzzle template system also offers several more options for envelope templates. I LOVE the Coluzzle mini envelopes because there are soooo many uses for them. If you scrapbook, then you probably have a good idea of how handy it can be to have little envelopes to use in your layouts. You can hold all kinds of ephemera inside them or use them to store papers with hidden journaling inside. Mini envelopes also come in handy for gift giving; fold a tiny note inside and then attach them to gift bags, presents, floral bouquets, etc. 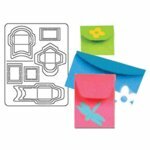 Then there are the Fiskars Envelope Templates for use with the Fiskars Shape Xpress or other Fiskars Shape Cutting systems. 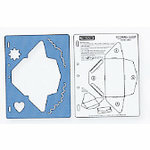 The templates are constructed of a durable, high quality plastic. Use them to make envelopes out of your paper lace doilies, or use them to create envelopes for use with all your handmade greeting cards. There are several different styles available. 7) Cut your paper lace doilies into 2.5″ x 3.5″ rectangles and use them as the basis for art trading cards or ACEOs. Paint, draw, chalk, ink, collage, or alter on top of them to finish them off! If you don’t already have a good shape cutter, I highly recommend Fiskar’s shape express. 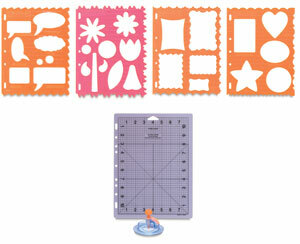 The Shape Xpress is the shape cutter that I use to cut circles and other shapes. It’s really affordable and really easy to use, and it works well with a variety of papers (including both photos and paper lace; I’ve used it to cut both, with very good results). I love it! I haven’t found anything better for the price. I do love punches too, but I think owning the ShapeXpress system beats owning a zillion punches in different shapes (takes less storage space, and ends up being less expensive considering all the different sized punches I’d need to buy.) However, there are soooo many other options for cutting circles. You’re really not limited, considering how many die cutters and punches and shape cutting tools there are on the market these days. You could also use this idea with heart shaped doilies and heart shaped templates or punches, too, although it might be a little bit trickier to match up the heart shapes. OK, so hopefully these ideas will get you started. I do have more ideas to add to this article, and I will be updating it with more project ideas and more pictures soon. So I hope you will check back!